Tonight and Tomorrow: Partly cloudy night tonight, with mild conditions. 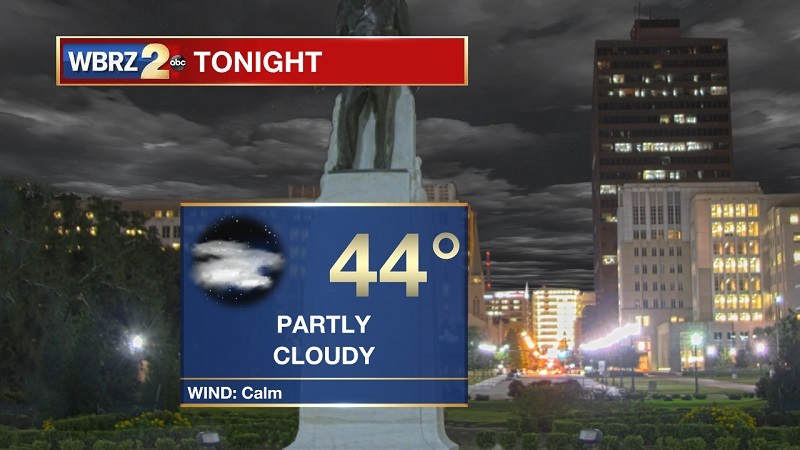 Temperatures will be slow to cool into the 40s around midnight, and continuing to drop to an overnight low of 44° with calm winds. An upper level ridge moves into the region, with a weak surface high accompanying it. This will keep things dry, and warming to near average high temperatures in the mid-60s on Monday. There is a potential for some patchy fog to develop overnight, but will lift around 8 AM. Partly cloudy skies will stay the course into Monday, with more sunshine on the horizon for Tuesday. Up Next: Clouds increase late on Tuesday, ahead of showers and isolated storms through the day Wednesday and Thursday morning. 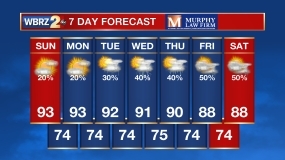 Drying commences by Thursday evening, with sunny and warming conditions through the weekend. The stubborn low pressure that has kept clouds and temperatures confined in the 50s, will finally depart toward the northeast on Monday. This will allow a surface high and an upper level ridge to build over the area Monday and Tuesday. The ridge will bring more of a southerly wind component through the beginning of the workweek, pushing warmer air across the Gulf Coast. 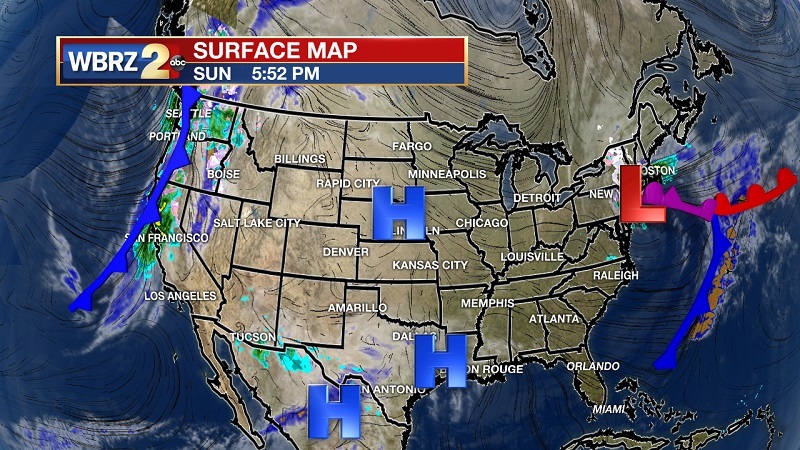 These conditions will not last long, as the high breaks up toward our east late Tuesday. 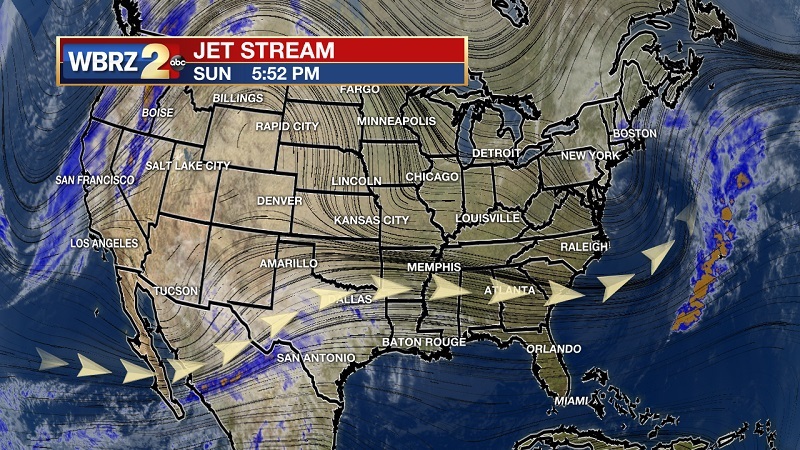 This is a result of an approaching upper level trough from the west, and a low pressure coming off the Gulf to converge over Louisiana on Wednesday. Scattered showers and isolated storms will stay the course through the day and into Thursday morning, with the majority of storm development staying confined south of the I-10 corridor. A stable marine layer will set up with the low pressure moving onshore, keeping severe weather from developing strong uplift and vertical instability. Showers will taper through the day on Thursday as the systems depart and mature as they travel into Alabama, dumping much more rain to our east. High pressure then sits in behind the system on Friday, keeping skies sunny and temperatures warming. Highs will be back in the mid-60s on Saturday, and could break into the low 70s on Sunday.